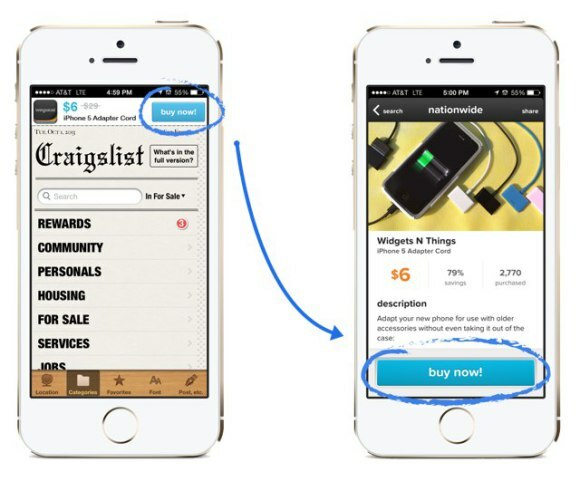 Mobile deeplinks open specific pages within apps, and they’re about to transform ecommerce. URX is a new deeplink mobile advertising startup that’s raised $3.1 million from A-list investors to help ecommerce companies get existing users back in their apps and spending money. URX places ads on other mobile properties that deeplink to purchase pages in apps like Hotel Tonight and LivingSocial. Not just ecommerce but all commerce is going mobile. But until recently, the small screen has lacked a fundamental piece of infrastructure for delivering buyers to what they can buy: deeplinks. Most URLs to mobile apps either open the homepage, the mobile site, or the app store. They essentially dump you at the front door of the store instead of in the aisles right in front of the product you want. But URX is developing the Turnpike open sourced framework for helping developers create URI deeplinks for every page in their apps. Why? Because then URX can analyze every product page in an ecommerce app, like for Hotel Tonight’s king suite at the Hilton San Francisco or a $20 LivingSocial deal for $40 at Bann restaurant in New York, and create thousands of ad variants to sell each one. It targets these apps’ existing users with the most tempting ad for the most relevant product at the right time based on a ton of big data signals about the customer and shows these ads in other apps. When users tap the ads, they’re deeplinked to the product page where they can buy what they saw in the ad, and URX charges the ecommerce developer a fee on top of what the ad cost to run. You might want to read that through again, or check out Michael Arrington’s write-up, because it’s the future of how mobile ecommerce advertising will work. Some of Silicon Valley’s top venture capitalists are betting that an avalanche of mobile ad spend is coming to ecommerce, and URX is going to soak it up. It’s the perfect time for URX, because Google, Facebook, and Twitter all recently announced some level of support for deeplinks, meaning a huge amount of inventory for the ads URX runs is opening up. URX will have to compete with fellow mobile retargeted ad providers like Deeplink.me, TapCommerce, and ActionX. However, these startups serve a wide range of developers and focus on high-level re-engagement users — just getting them back to an app’s homepage. URX is dead set on deeplinks to product pages for ecommerce apps because that’s where it sees the biggest potential. It’s got the right team for the job. The four co-founders share a fascination with the ad space. While three of them were in the same Sigma Phi Epsilon fraternity at UCLA, they’re serious scientists. CTO Andrew Look built the machine learning models that handled $150 million a year in ad spend at Shopzilla. CEO John Milinovich worked on Google Analytics and built supporting framework for Google Offers. The eight-person team now includes three machines learning experts. Milinovich tells me that “In the first 15 minutes of talking to [potential clients] we could see their eyes get really big and we knew there was an idea here.” So the company went to work building a special data set that would make it indispensable to ecommerce apps. The startup’s secret sauce is what you might call “the product graph”. While Facebook’s social graph links people to people and Twitter’s interest graph links people to information sources, the product graph links products to each other and the people who might want to buy them. Let’s say LivingSocial wants to sell a $50 deal for a $100 massage in San Francisco. It’s URX’s job to figure out which of LivingSocial’s existing users are most likely to want to buy that deal, find them on the web, and show them the ad that will bring them back and complete the purchase. URX would look for users who live in San Francisco or nearby, have previously bought deals around the $50 price point, and that bought similar deals in the product graph like massages, spa treatments, or other health and beauty packages. Once URX knows who target, it looks at trends about when each user previously bought deals. If I only buy LivingSocial deals from 5pm-8pm on Saturday and Sunday, that’s when URX will try to reach me. It can then use any biographical or purchase data on me to decide what ad creative to show me. If I haven’t opened LivingSocial in a while, it might use a “Come back!” headline, whereas a frequent user might see a “hot deal, going fast” banner. URX tests thousands of ad variants for each product until it finds the versions that perform best. The strategy works. URX’s test campaign for LivingSocial deliver a 0.8% CTR and a high return on ad spend, both double the industry average, and these results aren’t atypical. Ecommerce apps have built up huge install bases over the years, but struggle to get people back in their apps and making purchases. If URX can deliver these customers cost effectively, ecommerce companies will pour money into it. At the company’s basement office in San Francisco’s South Park , Milinovich boldy exclaimed to me “We want to be part of every transaction that occurs on mobile.” And even if it only facilitates a small percentage of all ecommerce sales, it’s a shaping up to be a huge, huge market. I wouldn’t be surprised to see a bidding war between the tech giants to buy URX, because this guy and his team really get mobile advertising. Milinovich left me with these thoughts.